All of our homeowners have a different story, coming from near and far….all planting their roots in this beautiful place we call the City of Roses. Everett’s first official “Happy Homeowner Spotlight” features Thom, who lives in NE Portland and fell in love with our homes. We are so happy he found his dream home. Here’s a peek into Thom’s home and what he loves about his Everett home. Yes, I was born and raised in Portland. I grew up on the east side, mostly in NE. That part of the city just feels like home and I have a definite connection to the neighborhoods in the area, as well as the “feel” of the architecture in the area. When it came down to it, I knew I had to live in NE in order to feel like I was home. We saw our first Everett Custom Home 2 years ago, about a year before buying our very own. I wanted it almost instantly, but was not in the market to buy a home at the time. Then I did a ton of homework comparing builders, newer homes and older homes, and each time we just kept comparing each house to an Everett home, and in the end they all fell short. It is hard to pick just one thing…we truly love it all, it’s a dream home. We just love the main floor layout and details. The built-ins, the fireplace, the box-beam ceilings, the butler’s pantry and formal dining room, the huge kitchen with eating nook. That and it still has a huge attached garage and a lower level room we have turned into a great media room. 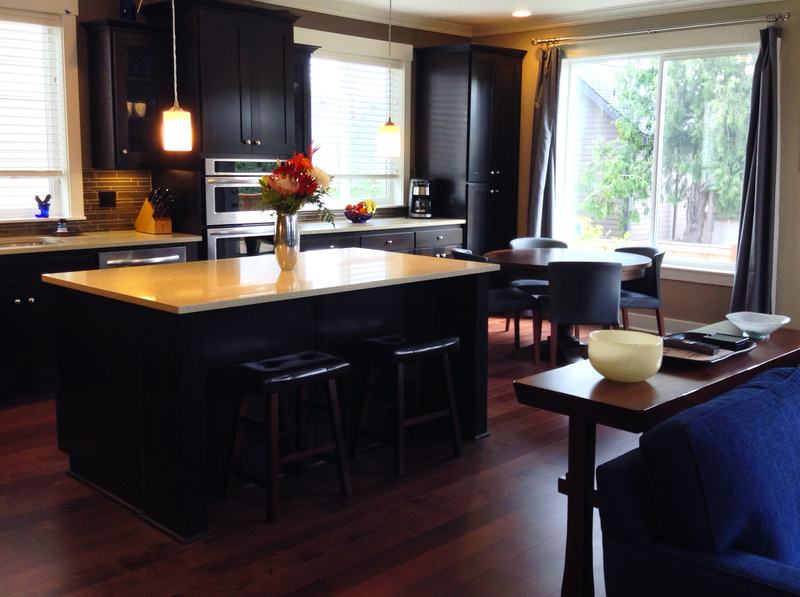 This home is exactly what we were looking for, even down to the cabinet color and finishes. We loved everything about our home even before moving in. We have done some personalization. We have installed some new light fixtures, blinds, drapes, bought some new living room furniture and painted some of the rooms. We have also planted some of our favorite trees. Most of this has been to take some of the newer/beloved aspects from our old home and incorporate those features into our new home. For instance, the dining room chandelier in our old homes was a recent birthday gift from Restoration Hardware, so we had to bring it with us to our new home. Just by painting a few rooms and adding a few touches before moving in, it made the house instantly feel like it was truly OUR home.